Dino-Green, Dino-Mite Mineralizer and All Natural Organic Soil Amendment! Join our Save the Soils Club! You'll receive our Newsletter or Special Offers no more than twice a month. Check back later for future discount$ banner here! 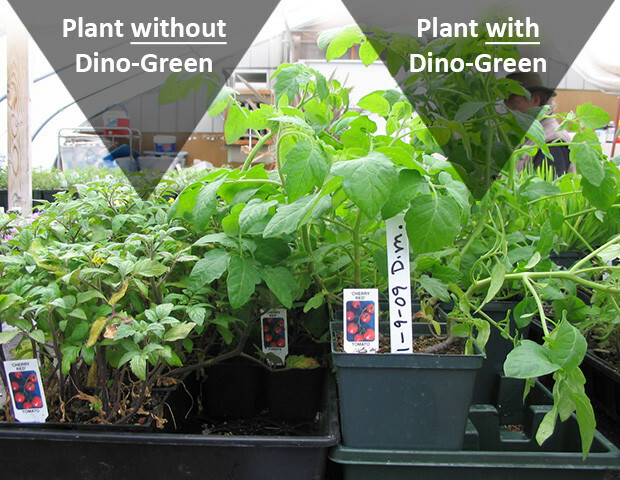 What Makes Dino-Green, Dino-Mite Organic Soil Amendment One Of The Best Of It's Kind? Pure, clean, all-natural. This rock dust formula is among the most bio-available organic soil amendments sourced from the finest premium quality minerals you can get. A healthy way to remineralize and recharge the energy in your soils. Minerals Are the Soils Energizer! This Exclusive Life-Force rock dust formula is now your best choice from Apples to Zucchinis for remineralizing and recharging the energy in your soils. 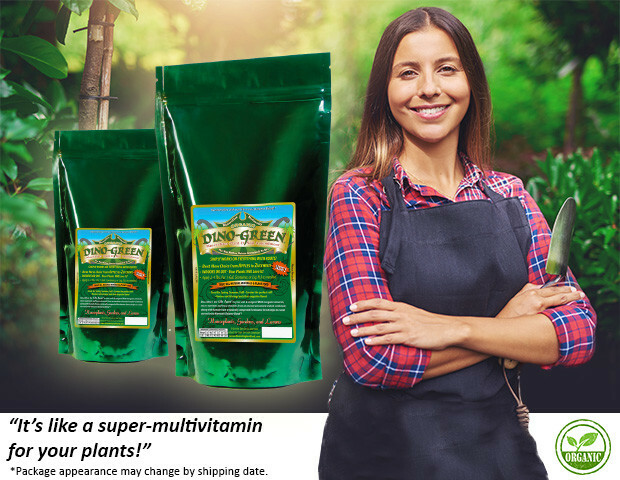 Over 70 years of empirical data, geological analysis, university lab testing, and testimonials from gardeners and professionals in all areas has proven that Dino-Green Mineralizer is "Dino-Mite" in helping to help create the perfect energized soil, giving blooms outstanding appearance and vegetables flavorful results! and Re-Energizes All Indoor and Outdoor Plants!" How? With over 80+ minerals, micronutrients, and trace elements, along with humic compounds, and combining inorganic minerals, micro-nutrients, and trace elements from an ancient volcanized seabed along with the organic and naturally composted matter of an ancient freshwater forest combined with other special minerals creates this most pure and powerful synergistic colloidal, positive & negative ion charged soil energizer that is readily available to stimulate your plants, condition the soil, and activate the roots to be the biggest and best they can be and bring back that exquisite flavor! We have conveniently blended several very pure and powerful all-natural organic minerals to create this simple-to-apply life-force formula so you don't have to! Heat and water advantages; handles 10-15 degree hotter and colder temperatures. Holds moisture in the surface of the soil so that roots can get established. Great for recharging garden boxes and deck containers as all composts and potting soils need mineral energy to breakdown and catalyze soils and organic matter. Helps heal ALL soils types! [Meets and exceeds all organic materials testing criteria]. Did you know how important minerals are to the body? Minerals are the energy for ALL soils and helps build a strong, healthy natural immunity for you and your family. Does your soil have all the energy it need to give you the results that you wish for? If you were to source and buy all of the natural minerals that we use, and proportionately blend, the cost would be much more than our Harmonic Balance Blend. Did you know that culinary (chlorinated) water kills the life-force in soils? Dino-Green mineralizer replenishes the life-force that chlorine kills. Break the chemical addiction and try it on your struggling houseplants or garden vegetables, or as the start of a healthier you! Visit our online store now - Cheers! So How Important Is Good Soil to You?"